Tzatziki, tzadziki, or tsatsiki is a Greek meze or appetizer, also used as a sauce for souvlaki and gyros. Tzatziki is made of strained yoghurt (usually sheep's-milk or goat's-milk in Greece and Turkey) with cucumbers, a good amount of garlic, salt, usually olive oil, pepper, sometimes dill, sometimes lemon juice and parsley, or mint added. The cucumbers are either pureed and strained, or seeded and finely diced. Olive oil, olives, and herbs are often used as garnishes. 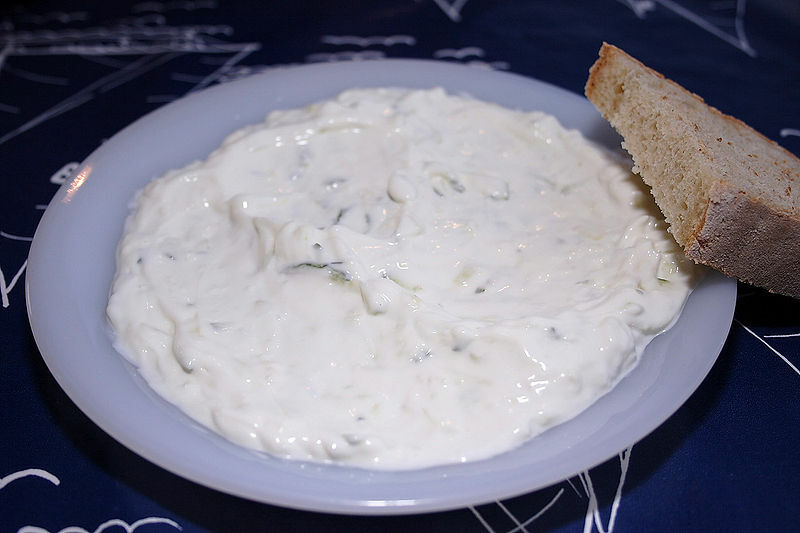 In touristy restaurants, and outside Greece and Cyprus, tzatziki is often served with bread (loaf or pita) as part of the first course of a meal. Greeks, Cypriots and those from all over the Middle East use this dish as a side dish to a meal with meat. The acidity cuts the fat, thus tzatziki is also used as a sauce for souvlaki and gyros, in which case it may be called cucumber sauce (especially in the U.S.). In Bulgaria and the Republic of Macedonia, the same dish is known as "dry tarator" (Bulgarian: сух таратор, Macedonian: сув таратор or таратур) or "Snezhanka" salad (салата "Снежанка"), which means "snow white salad", and is served as an appetizer. During preparation, the yogurt (Bulgarian: кисело мляко, Macedonian: кисело млеко) is hung for several hours in a kerchief and looses about half of its water (drained yogurt, Bulgarian: цедено кисело мляко, Macedonian: цедено кисело млеко). The cucumbers, garlic, minced walnuts, salt and vegetable oil are then added. A variation in the Caucasus mountains, called ovdukh, uses kefir instead of the yogurt, thus creating a refreshing summer drink. This can be poured over a mixture of vegetables, eggs and ham to create a variation of okroshka, sometimes referred to as a 'Caucasus okroshka'.